While London may have a reputation for its dreary, rainy weather, its annual precipitation totals pale in comparison to the rainiest cities in the United States. Even New York City, with an average of 49.9 inches of rain per year, and both Rochester and Buffalo, New York, with 167 days of rain each year (or just 198 dry days), are rainier than London. London averages approximately 106 rainy days each year and receives a total of 22.976 inches (583.6 millimeters) of precipitation annually. Additionally, the rainiest place in the United States is Mt. Waialeale on Kauai in Hawaii, which gets approximately 460 inches (11,684 millimeters) of rain each year; however, the peak of this volcanic mountain is only accessible via helicopter. Overall, London has a relatively temperate climate with temperatures ranging from a low of 37 degrees Fahrenheit (3 degrees Celcius) in January to a high of 72 degrees Fahrenheit (22 degrees Celcius) in July. 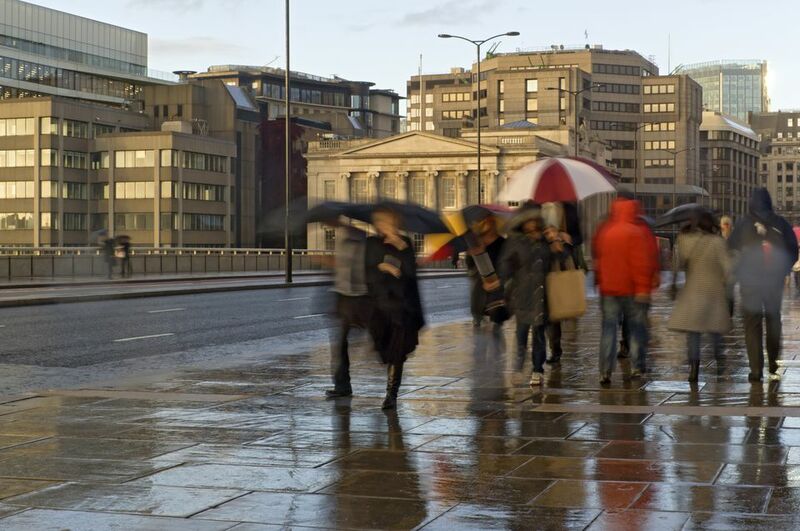 Perhaps the reason London is considered to be an overcast, damp city is that rainfall totals stay consistent throughout the year, with each month seeing between 13 and 19 days of precipitation, totaling between 1.3 and 2.8 inches (35 and 71 millimeters) monthly. Additionally, London receives relatively few daily sunshine hours throughout the year, getting only one to two hours in the winter months (November to early March) and four to seven hours daily the rest of the year. Considered the rainiest of America's major cities, New Orleans experiences 119 days of rainfall and accumulates a total of 63.5 inches of precipitation annually. Overall, the climate in New Orleans is temperate if not extremely humid in the summer; temperatures range from a low 47 degrees Fahrenheit in January to a high of 90 in July and August, with an average annual high temperature of 77.1 degrees Fahrenheit and an average low temperature of 62.3. The rainiest season for New Orleans is in the summer during the height of the Atlantic hurricane season (June to November) with May through September receiving 10 to 15 days and 5.5 to 7 inches of rain per month, on average. Conversely, the driest time to visit New Orleans is in mid-spring and throughout the fall season; May, October, and November all get about seven days of precipitation and only total 3.6 to 5.4 inches of rain per month. Even one of sunny Florida's most popular tourist destinations, Miami, is rainier than London, getting a total of 61.9 inches of rainfall annually over the course of 128 days. However, Miami's annual weather is a bit drier and hotter overall with temperatures ranging from a low of 60 degrees Fahrenheit in January to a high of 91 in July and August and high and low averages ranging between 69.9 and 84.2 degrees Fahrenheit. Like New Orleans, Miami's rainiest season is in the summer, throughout the Atlantic hurricane season. You can expect 13 to 18 days of precipitation monthly between June and October with 6.3 to 9.8 inches of rainfall per month on average. The driest seasons are winter and spring when Miami gets just five to seven days of rainfall per month, accumulating between 1.6 and 3.1 inches of precipitation monthly. Although off the beaten path of American tourism, the city of Birmingham and the surrounding mountainous lakes provide ample opportunities for outdoor adventures, despite the relatively wet climate of the region. Birmingham temperatures range between a low of 34 degrees Fahrenheit in January to a high of 91 in July and August, with an annual average high temperature of 73.8 degrees Fahrenheit and an annual average low temperature of 52.8. The wettest season in Birmingham is spring, which sees between nine and 11 days of precipitation and a total accumulation of between 4.3 and 6.2 inches of precipitations (including snowfall in March). Conversely, the driest season is late summer and early fall (between September and November), when the city sees seven to nine days of rain and total accumulations of 3.4 to 4.8 inches of rainfall per month. Unlike America's other rainiest major cities, Memphis' rainfall totals don't vary much throughout the year, with each month accumulating between 2.8 and 5.7 inches of rainfall over 10 to 15 days. Temperatures are also relatively cooler than elsewhere in the south, with a low of 33 degrees Fahrenheit in January and a high of 92 in July. The wettest seasons in Memphis, by a slim margin, are winter and spring, when the city gets over five inches of precipitations (including one to two inches of snowfall) per month. Conversely, the summer months of July through September receive the least amount of rain accumulation, totaling between 2.8 and 4.6 inches of rain per month during the season. Another of Florida's most popular tourist destinations, especially for its theme park attractions, Orlando is also rainier than London with a total of 53.1 inches of precipitation and 75 days of rainfall per year. Like most of central and southern Florida, Orlando's climate is relatively warm and humid throughout the year, with a low of 50 degrees Fahrenheit in January and a high of 92 in July and August, an annual high average of 82.4, and an annual low average temperature of 64.3 degrees Fahrenheit. The rainiest season in Orlando is the summer and early fall, also known as the Atlantic hurricane season, wherein each month from June through September sees between six and 8.7 inches of precipitation. The driest season, on the other hand, is winter, which only gets an average of 2.5 inches of rainfall per month from November through mid-March. While not as rainy year-round as London, Jacksonville sees enough rainfall during hurricane season (June to November) to make it one of the rainiest cities in America, accumulating a total of 50.4 inches of precipitation over the course of just 74 days. The city experiences its lowest average temperatures in January, which sees downward of 39 degrees Fahrenheit, and July and August are its warmest months at 92 degrees Fahrenheit; the annual average high and low temperatures range from 79.9 to 55.9 degrees Fahrenheit. Like other parts of the coastal southeastern United States, Jacksonville's rainiest season is during the summer and the Atlantic hurricane seasons, roughly from June through September, when the city receives 6.5 to 7.2 inches of rain per month. Fortunately, Jacksonville has also only ever been hit by one hurricane directly (Hurricane Dora in 1964), but it still receives large amounts of hurricane-like conditions due to its proximity to the path of most of these tropical storms. On the island of Kauai, Mount Waialeale rises 5,148 feet above sea level and holds the world record for being the rainiest place on earth. This is largely due to its unique geology; its volcanic shield catches moisture from trade winds, and its steep cliffs trap and concentrate rainfall, resulting in a total of over 460 inches (11,684 millimeters) of rain accumulation each year. While London is definitely a reasonably rainy city, it does not really compare to the rainiest places in the United States or in the world. The perception of London as "the rainiest city" definitely comes from popular culture in movies and songs that describe London as a rainy, foggy place—it's often described as gloomy. While the rainy atmosphere has become part of London's identity, it turns out that it's not entirely accurate; it seems instead like London's rainy reputation has been the result of hundreds of years of bad weather public relations (PR). Whether you love or hate the rain, it’s always good to have an idea of what to expect on a big trip. Whether you’re planning a trip to London or visiting one of the rainiest cities in the U.S.A., be sure to check the weather ahead of time and be prepared before you go by packing a lightweight umbrella, rain jacket, and shoes versatile enough to withstand the puddles.